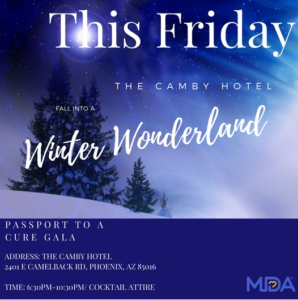 Team Vermilion was honored to win the business to come on as decor and design for Muscular Dystrophy Association’s Passport to a Cure Gala here in Phoenix, Arizona. 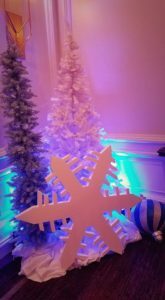 Held at the stylish The Camby Hotel, this years theme was winter wonderland. 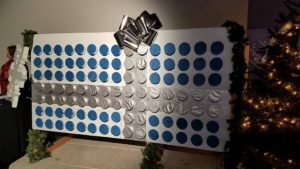 Our vision was filled with the snowflakes found on their invitations and website. 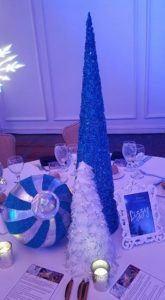 Several shades of blue’s and purples mixed with white of course brought the brisk sharp style of this event together. 4′ Snowflakes mixed with the seasons’ hot ticket of colored tree’s lined arrivals and vignette’s through out the space. 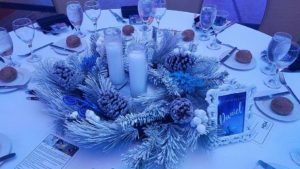 4 different centerpiece designs made the main reception room included 25″ white flocked wreaths filled with candles…. 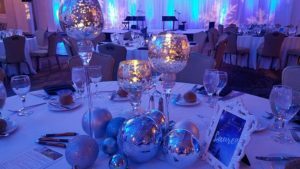 over sized blue and silver ornaments surround a trio of tall mercury glass candle holders, followed by large blue sparkled cones, white and silver feather tree’s and more…. 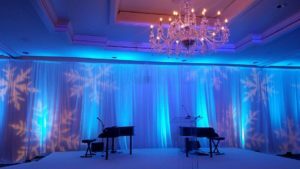 The entire back wall was draped in white with custom hard framed screen wraps also in white flanked a white carpeted stage set for the dueling piano’s for entertainment. 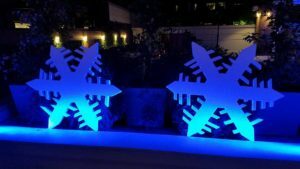 Snowflake projections along the other walls with a heavy dosage of blue up lighting brought the whole room together. Which such an amazing cause at hand Vermilion Events felt honored to work as closely as possible with the committee. Families are at the heart of MDA’s mission. A caring and concerned group of families started MDA in 1950, and we continue to relentlessly pursue our promise to free families from the life-threatening effects of muscular dystrophy and muscle-debilitating diseases today. Read more about MDA’s journey and the progress we’ve helped make possible. MDA uses every dollar we raise wisely to ensure it has the greatest impact in the fight to end muscular dystrophy. We strive to provide you with transparency and clarity around how contributions make a difference and how MDA is supporting your community. 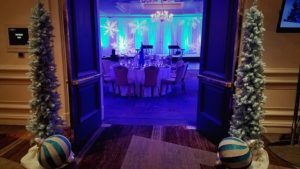 With all of our Non-Profit clients, Vermilion Events works with the budgets and total needs to make sure the final product is more then expected.